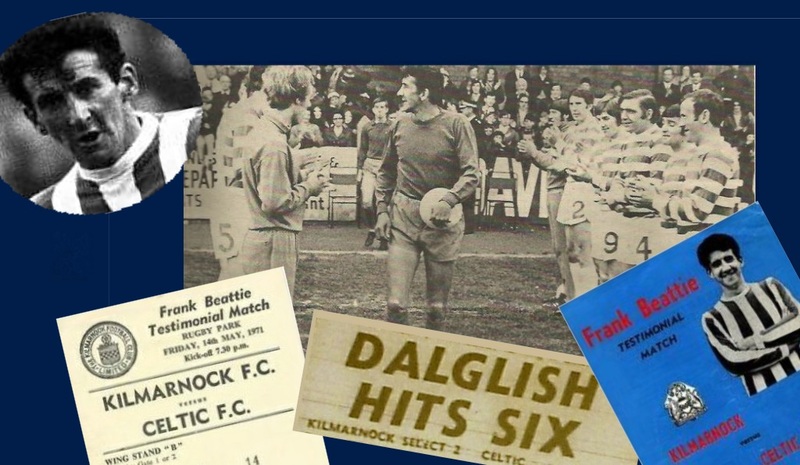 Big Frank, as he was universally known, was one of Kilmarnock’s longest-serving players. To supporters he was the best-loved player of his generation and perhaps of all time. In a one-club career encompassing nineteen years he made a then record for the club of 422 league appearances, a total surpassed since only by Alan Robertson. He was the first Kilmarnock player to appear 600 times for the club in first class outings (again, only Robertson has bettered Beattie’s total of 602) and his League Cup figure of 80 will probably never be beaten. 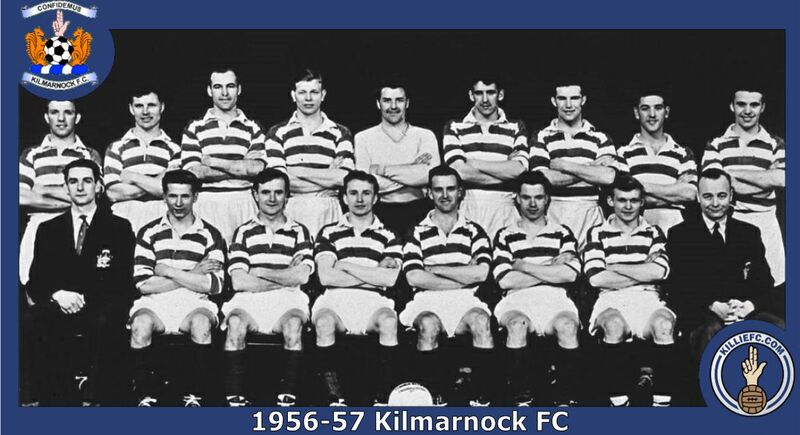 In addition to skippering Killie to their greatest-ever achievement in winning the title he played in the losing side in three Cup Finals, the Scottish Cup of 1960 and the League Cup in 1960-61 & 1962-63. He was also capped by the Scottish League and his 48 goals for Killie means he lies just outside the club’s top thirty all-time scorers. Francis Whitfield Beattie was born in St Ninian’s in Stirling on October 17th 1933. He played schools football for St Modan’s (a few years ahead of Billy Bremner), juvenile football with Dunipace & Cowie and then moved on to Bonnybridge Juniors. He spent just six weeks in the junior ranks before signing for Kilmarnock in October 1953. Early in his career Frank was an inside-left and like so many players of that time he was also a part-timer. By day he was a coal miner, working in the pit at Plean until 2.30 pm then going to his father’s in Larbert for lunch before catching a train to Kilmarnock for training. This was a punishing travelling schedule of over 500 miles per week that Frank maintained throughout his career. Playing in the reserves in the promotion-winning season of 1953-54, Frank made his first team debut away to St Mirren in the League Cup the following season. Although playing out of position at inside-right he marked his debut with a goal though Killie lost 3-2. 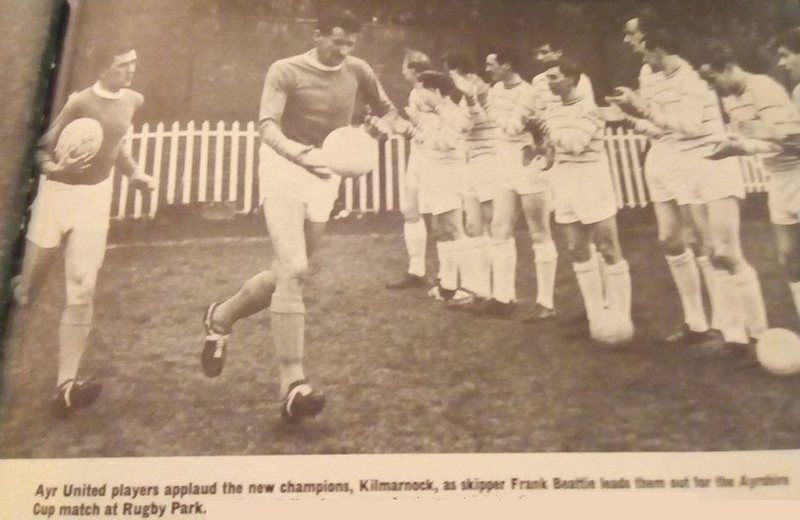 One day short of a year since his first reserve appearance Frank made his Scottish League debut on October 9th 1954 at Rugby Park against Partick Thistle. Like the League Cup he scored on his debut – the first home goal scored in Scottish football’s top flight by a Kilmarnock player since April 1947 – but also like the League Cup the match ended in defeat – by 2-1. 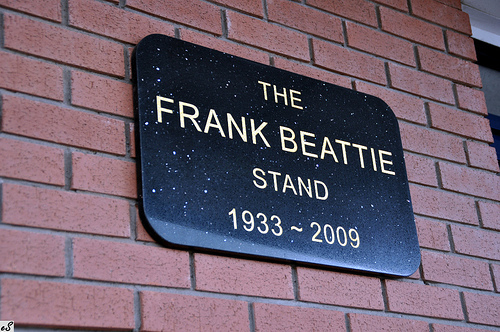 By the middle of 1955-56 Frank had established himself as the regular inside-left and he took part in some notable victories, including against both the Old Firm (he played in the last Killie team to win at Parkhead - until Kenny Shiels reign - in December 1955) and scoring the only goal of the game in a Scottish Cup tie against Ayr United. At first the arrival of Willie Waddell as manager in 1957 seemed to make little difference to Frank who was viewed as one of those versatile players who could be moved around to make way for others. But he still made his mark, scoring twice at Ibrox as Killie beat Rangers 4-3 in the league. In his first full season as a half-back Frank played in a team which finished runners-up in the league, were beaten finalists in the Scottish Cup and represented Scotland in an international tournament in New York where they beat Bayern Munich and English champions Burnley before losing to Brazilians Bangu in the final. 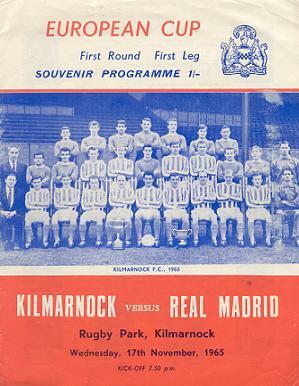 Killie reached the League Cup Final in 1960-61 but lost again to Rangers in the final. They finished runners-up in the league again, missing out by a single point. 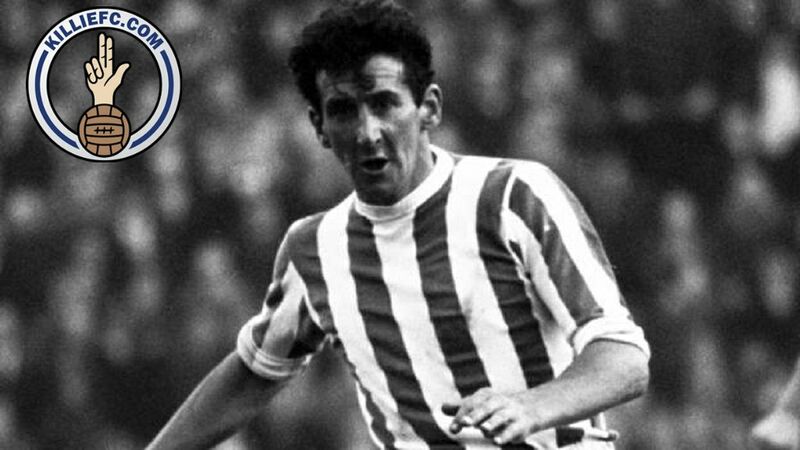 At times that season Frank had played at left-half as well as on the right and when Bobby Kennedy was transferred to Manchester City the number six shirt became his own. It was at right-half though that he made his only international representative appearance when he played for the Scottish League in a 1-1 draw with the League of Ireland at Dalymount Park in September 1961. 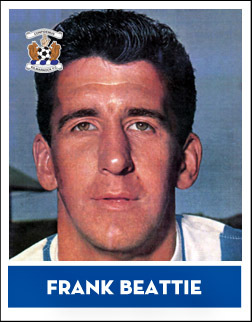 Frank Beattie was dreadfully unlucky when it came to the international scene. Injury had forced him to withdraw from the Under-23’s early in his career and at his peak he found himself a contemporary of Pat Crerand & Bobby Murdoch on the right side of midfield and Dave Mackay and Jim Baxter on the left. Wharton’s actions only helped cement Frank’s legendary status at Rugby Park. Playing in every one of the club’s 52 competitive games that season he won the supporters’ Player of the Year Award. Frank had already turned thirty before becoming club captain in November 1963 and he led to the side to what was their fourth runners-up position in five seasons in the league. 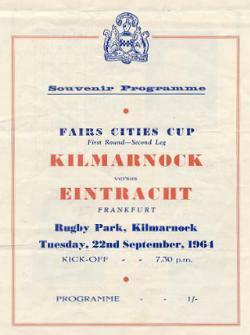 Frank led Killie on their European debut when they rallied from four goals behind to beat Eintracht Frankfurt in the Fairs Cup. 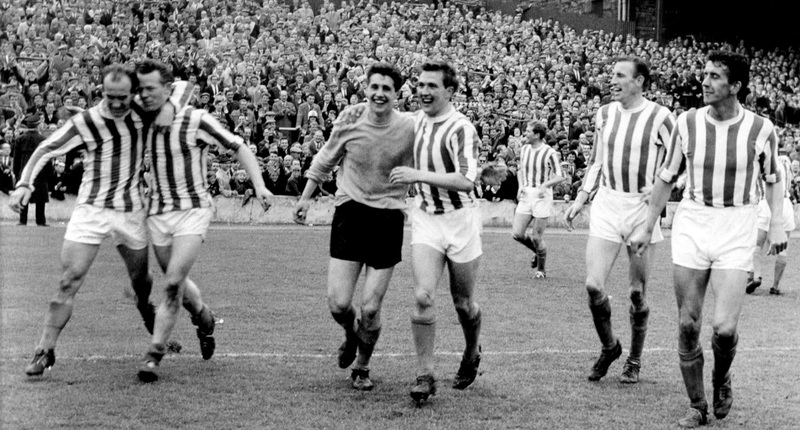 And Frank was the skipper too on that unforgettable afternoon at Tynecastle on the final day of the season on April 24th 1965 when Kilmarnock beat Hearts by 2-0 to leapfrog the home team at the top of the table and take the title by 0.04 of a goal. It was Frank who hoisted the League Championship trophy as it came to Ayrshire for the first time and Killie won their first major honour for 36 years. And they were. Victory in that tie brought Real Madrid to Rugby Park in the next round and the chance to play in the Bernabeu against Puskas & Gento – a far cry from the reserve matches in the ‘C’ Division in which Frank had started out. 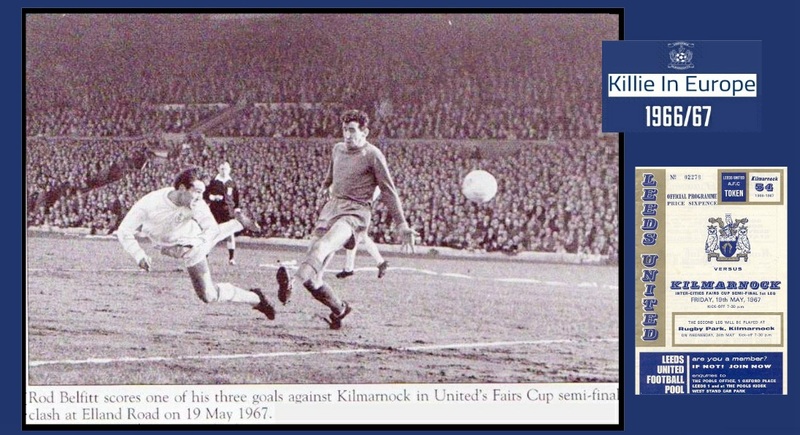 1966-67 was Kilmarnock’s best in Europe and Frank led the side to the Fairs Cup semi-finals where they were beaten by Leeds United. Frank Beattie was a man who liked to put something back into the game and that was demonstrated in 1968 and 1969 when he coached Cambusbarron Rovers to victory in two successive Scottish Amateur Cups. By then his career was winding down but he was still an important part of the team as the 1960s reached their end. Frank had played 17 games in 1969-70, including five in Europe and had broken Mattha’ Smith’s 38-year-old club appearance record when he lined up for the last match of the decade, at Celtic Park on December 20th 1969. After just fifteen minutes Frank and Jimmy Johnstone both chased after a loose ball and collided. The crack was heard all over the ground as Frank lay motionless on the pitch with his face twisted in agony. 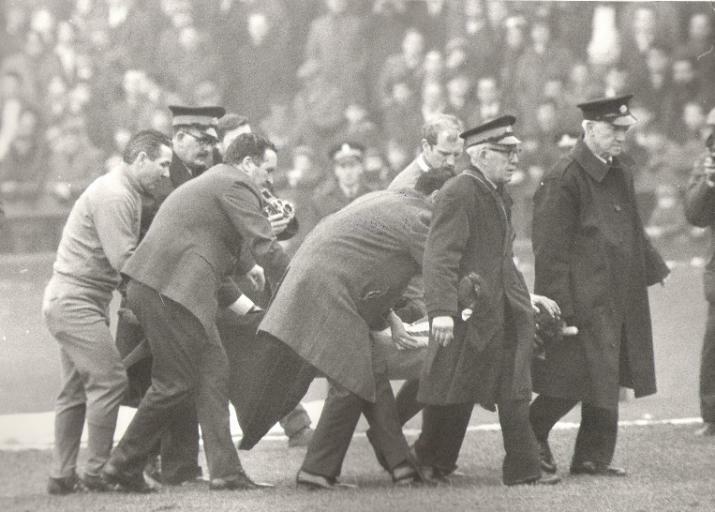 So bad did it look that Jock Stein left the dugout to accompany the stretcher to the ambulance. Frank’s right leg was broken and at 36 it seemed his career was over. But miners are a hardy breed and Frank Beattie was determined to come back. It was a long hard journey, complicated by illness, and it was sixteen months before he played again, in April 1971, for the reserves v Clyde. A crowd of 1,390 turned up at Rugby Park, more than watched some Clyde first team fixtures. 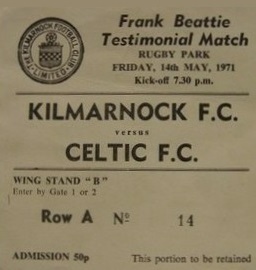 The end of the season brought a long overdue and well deserved testimonial match v Celtic. The visitors had just won the Scottish Cup two nights previously but Jock Stein brought a strong selection down as well as the trophy itself. 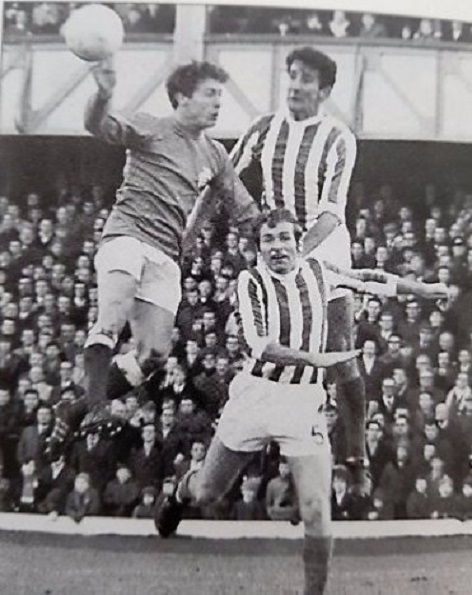 A crowd of 8,727 turned up to see a Killie side augmented by guest stars Willie Johnston and Colin Stein from Rangers, Alex Ingram of Ayr United and ex-Killie heroes Gerry Queen and Bobby Kennedy. But while the occasion was Frank’s, the night belonged to an unknown youngster in the Celtic line-up called Dalglish who scored six times in a 7-2 win for the guests. Amazingly, Frank returned to first team action close to his 38th birthday and almost two years after the leg break. He brought back memories of his early days with a stunning 25-yard strike at Easter Road in the League Cup. On August 28th 1971 he made his last appearance at Rugby Park as Killie beat Dundee United 4-2 and his final first team appearance came in a 3-0 defeat at Motherwell three weeks later. 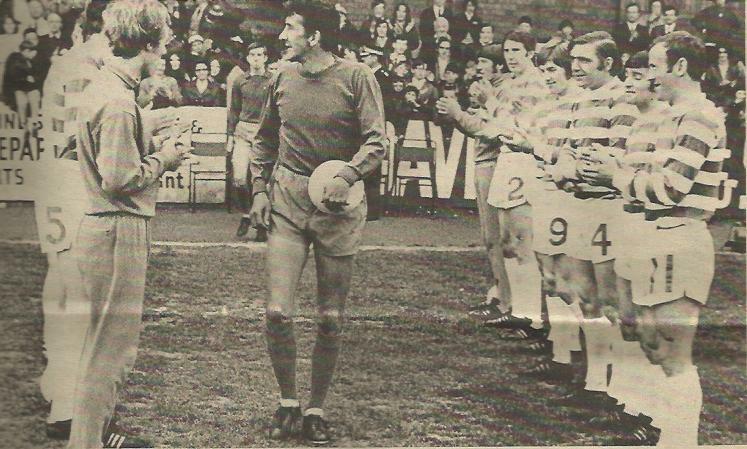 At the end of 1971-72 Frank departed Rugby Park as the club’s longest-serving post-war player – a title that remains to this day. He had brief spells in management at Albion Rovers and Stirling Albion, including one memorable game with the latter when they stood (unsuccessfully) between Killie and promotion. Albion led Killie 1-0 at the break, but after Frank's half-time team talk, Killie would score two goals (Fleming & Morrison ... who else?) to clinch promotion at the end of the 73-74 season. It wasn’t just the glory of skippering Killie to the title that turned Frank Beattie into a Kilmarnock legend. Nor was it the heartbreak of a late career leg break or the injustice of being deprived of a Cup Final equaliser. It was also the dedication of a man prepared to make that trek from Stirlingshire every day, a man who in his younger days thought nothing about putting in a full shift down the mine then playing football afterwards. 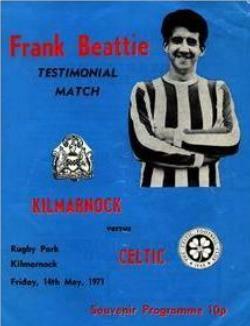 It was also the sheer consistency of performance allied to that dedication that made Frank Beattie such a hero to Kilmarnock supporters. Sadly, Frank didn’t enjoy good health for some time prior to his death but on those occasions when he was able to attend football he was still immaculately turned out and still the centre of attention for the fans no matter how many other ex-players may have been around. I always loved kicking a ball about in the streets of the mining village of Plean, where I was born. My uncle bought me a proper leather football when I was very young and used to play with me. My earliest memories of organised football are of playing outside right in St Modan's school team which was very successful. I played with Dunipace Thistle for 2 years, then Bonnybridge Juniors. 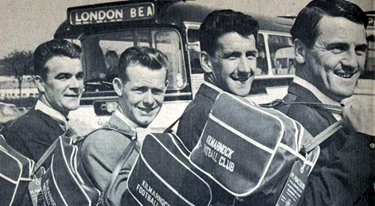 I had been there for only 6 weeks in 1953, when I was asked to have a trial with Killie. The match was against East Stirling and I must have done quite well because Malky McDonald signed me straight afterwards. 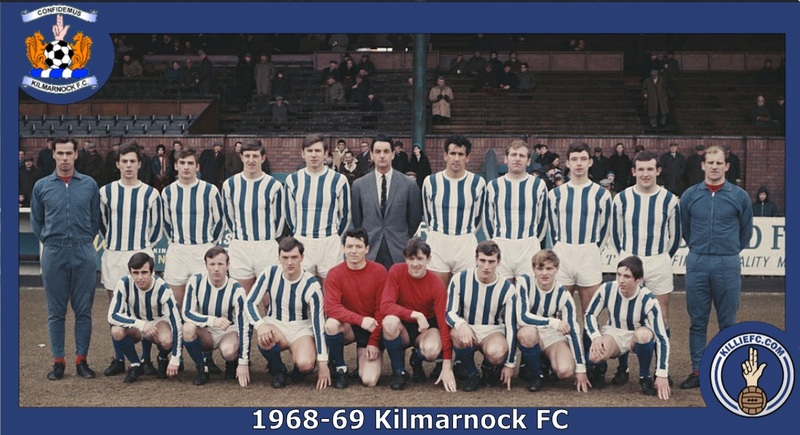 For a number of years up until the age of 26, I played part time with Kilmarnock. My main job was as a miner. On two days of the week, I left for work at 6am, worked down the mine from 7am until 2.30pm and then went to my father's house for dinner. I took the train from Larbert to St Enoch and on to Kilmarnock for training. I would not arrive home again until 12.30 or 1 o'clock in the morning. It was a long day with a lot of travelling, but I loved the game. I eventually became a full-time professional in 1960. 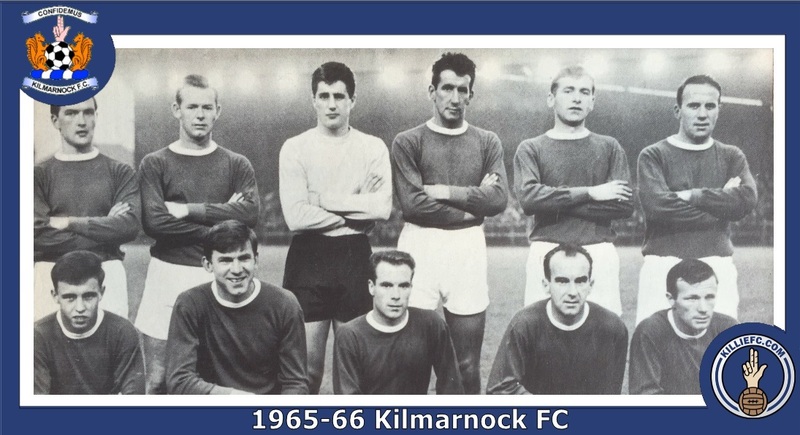 The golden era at Killie? Willie Waddell's arrival signalled great changes at Rugby Park and I felt that he and I had a good rapport. We had a great bunch of guys then too. A lot of harmony and team spirit was created by the trips made to the United States to play in the invitation tournaments, and by playing top continental teams. Willie Waddell (right) put a very good team together and we came so close to major honours on numerous occasions. Unfortunately, we always seemed to come out second best. We were definitely the most consistent team in the country in the early 1960's and if you keep knocking at the door, eventually you will get in. 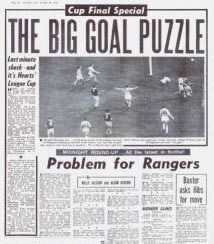 We finally made it in 1965, but it wasn't until Davie Sneddon scored with his head in the final match versus Hearts that I knew we were going to win the Championship. I recall leaving my wife at home that day as she was expecting our 2nd daughter. When the final whistle went I remember the mad figure of Willie Waddell running onto the park to give us a big hug. 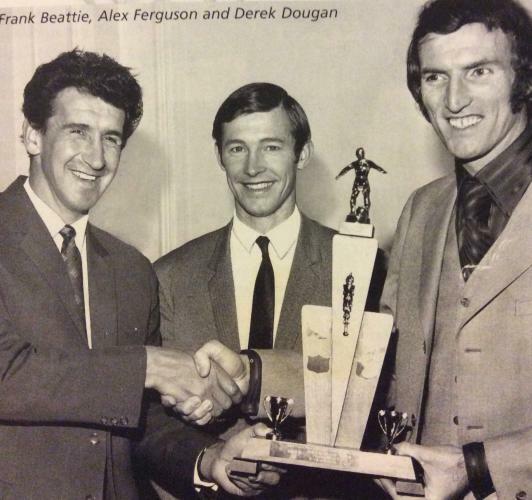 It has been said that I should have won the 'Player Of The Year' that season, but it went to Billy McNeill instead. It was just one of those things, but an 'Old Firm' player winning the honour would obviously sell more newspapers. The championship was only one of the highlights of my 19 years with Killie. There were also the great European encounters. Unfortunately, I missed the opportunity of playing against Real Madrid because of injury, but there was the Eintracht Frankfurt game! I didn't enjoy all the travelling abroad, but the games themselves were marvellous to play in. There were some adventures too, such as going to Albania. It was a lovely country, but very poor and it was impossible to spend your money there. There are many other memorable moments on the home front too, such as a Killie versus Falkirk match when I scored twice in a 3-0 victory. I also remember a semi-final against Rangers when we lost 6-4, but I had a good game. 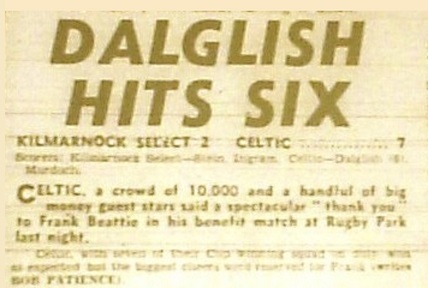 I broke my leg in a match against Celtic in December 1969 and didn't play again for a year. My Killie career came to an end when I was given a free transfer at the ripe old age of 39. I would like to be remembered as a dedicated professional who always gave of his best - 100% plus in every game. I went on to manage Albion Rovers for 1 season and then Stirling Albion for a further season. After that I retired from football and became a newsagent for the next 20 years. At the moment, I still keep myself very well occupied. I play golf and bowls, both outdoor and indoor and also enjoy spending time with my grandchildren. I still follow Killie's progress and look out for their results. I was very proud when Killie won the Scottish Cup and it was great to see some of the old boys and Malky MacDonald again. Things are obviously going well at Rugby Park these days and my final message to Killie fans would be to 'always stand by your team'.